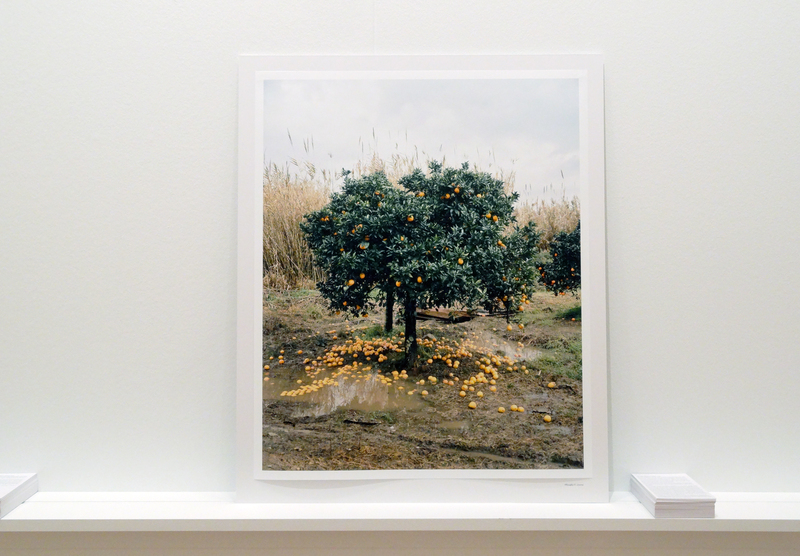 Eva Leitolf is a visual artist and photographer. When Eva Leitolf (1966) is not travelling for her work, she lives in a farmhouse in the Bavarian Forest, Germany. She studied at University GH Essen, gained her MFA at the California Institute of the Arts and now teaches regularly at international art schools and universities. Her works have been shown at international institutions including the Pinakothek der Moderne in Munich, Frankfurter Kunstverein, Sprengel Museum Hannover, Rijksmuseum Amsterdam, Fotomuseum Rotterdam and the Wallach Art Gallery in New York. Eva’s work regularly features in the colour supplements of Süddeutsche Zeitung and Die Zeit. Her publications include: Postcards from Europe 03/13 (ongoing project on migration and how European societies react to it, since 2006), Deutsche Bilder – eine Spurensuche (image text work on racist and xenophobic violence in Germany, 1992-2008) and Rostock Ritz (a research of Namibian-German colonial past 2004). This position is based on Eva Leitolf´s contribution to the CA PUBLIC! Un-/stable Narratives: Artistic Views on Migration with lectures by Eva Leitolf and Özkan Gölpinar during the CA PUBLIC! initiated by Camera Arts, Lucerne University of Applied Sciences and Arts, Lucerne School of Art and Design, March 3, 2016. 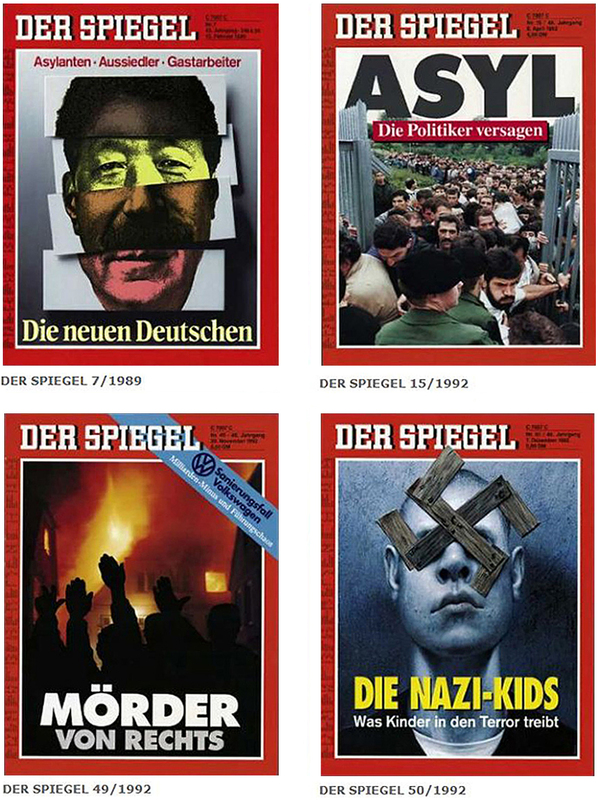 You might think that these were current issues of the weekly Der Spiegel, but they are actually from 1989 and 1992. The narratives seem to recur. The cover on the very left introduces the “New Germans”: “Asylanten” (a derogatory term for asylum seekers), “Aussiedler” (the ethnic German immigrants from Eastern Europe and the Soviet Union) and “Gastarbeiter” (foreign workers). 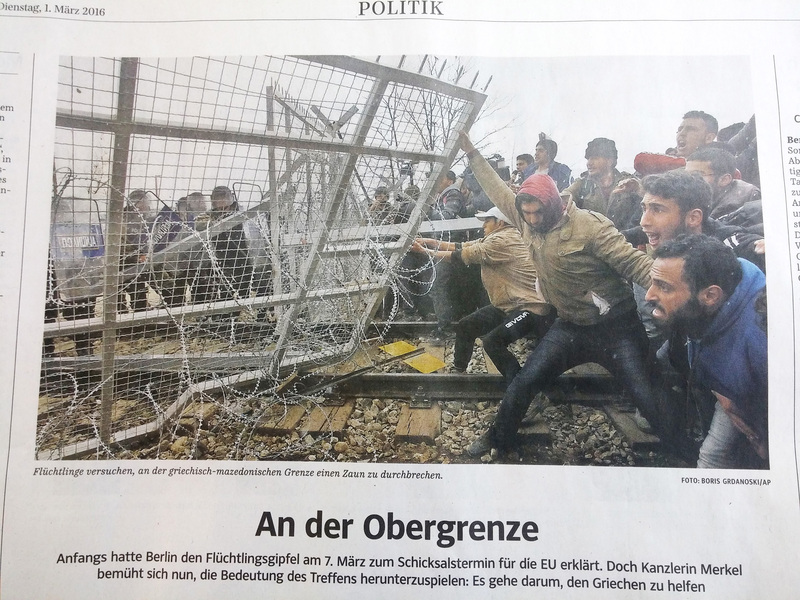 The second cover with the headline “Asylum: Politicians are Failing” shows a seemingly endless mass of apparently foreign-looking people confronting two seemingly helpless border guards. (The image is a montage by the way.) After a series of serious arson attacks on refugee reception center and homes of people from migrant backgrounds, the third cover presents “Murderers from the Right”, while the fourth identifies “Nazi-kids” as the perpetrators. This narrative granted readers a certain comfort, without the need to reflect any further on the social, political and economic conditions of migration and racist violence. 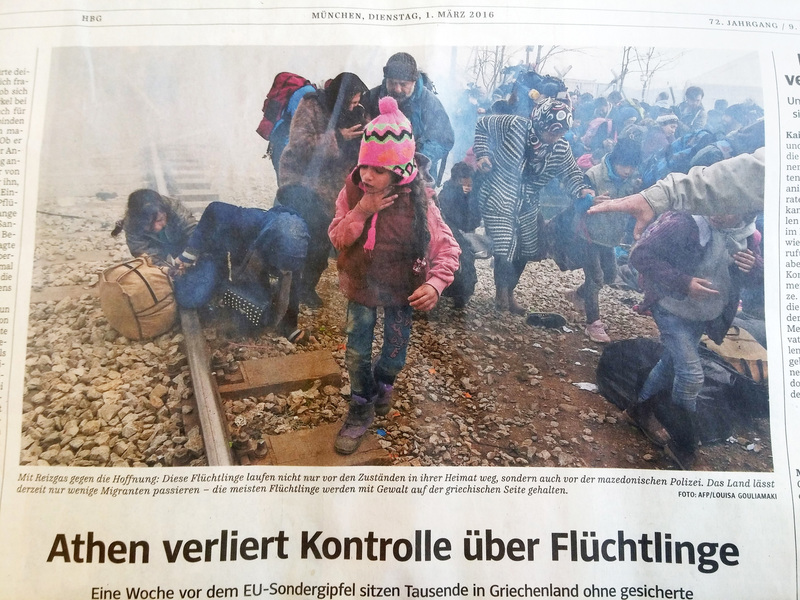 Narratives on migration in German mainstream print media are overlapping, changing and sometimes contradictory. But the dominant, generalizing and discriminating image discourse consists of narratives like: The Boat Is Full; The Unstoppable Flood; Europe as a Fortress; The Suffering Victim; The Child in Need; The Selfless Helpers; and The Criminalized, Illegal Intruder. Those visual narratives establish an asymmetrical regime of seeing and being looked at and serve as destabilizing agents fostering restrictive security policies and tools to reinforce a national identity imagined as stable and homogenous. Images are instrumentalized as deterrents to migrants heading towards the EU and support a spectacularizing, polarizing and unconstructive discourse. As culture producers we should take a closer look at which stories are told or not told, as well as by whom and for which audiences. What are the motivations, interests and agendas behind a narrative? Who benefits from it? How do narratives manifest, reinforce or counteract existing power relations? What would happen if we were to stop conceptualizing migration as a problem, as contradiction and threat to a society imagined as stable and homogenous? What would happen if we started to think of migration as a human condition, a “total social fact” (as Sabine Hess suggests in her paper Hegemoniale Diskurs-Bilder brechen in Burcu Dogramaçi, Migration und künstlerische Produktion. Aktuelle Perspektiven, Bielefeld 2013)? How would this affect our gaze and our production of knowledge? Of art? Postcards from Europe examines the ways Europe, and specifically the European Union, deals with its external borders and the associated internal conflicts. I am interested in the ways the European Community relates to migration, administers undocumented migrants, and works to tighten control of its external borders. Since 2006 I have undertaken long field trips to Spain and the Spanish exclaves of Melilla and Ceuta in Morocco, Hungary, southern Italy, and Greece, as well as to the English Channel ports of Calais and Dover. I am currently working on sites in Germany and Austria. The texts draw on many different sources. Media reports, police files, and press releases usually constitute the starting point for my research and shape my fieldwork itineraries. While travelling I keep a journal, and on site I speak with people connected to the events: migrants, seasonal workers, activists, trade unionists, local politicians, border guards. Later, all these collected voices and sources come together to form the basis of the postcard texts. 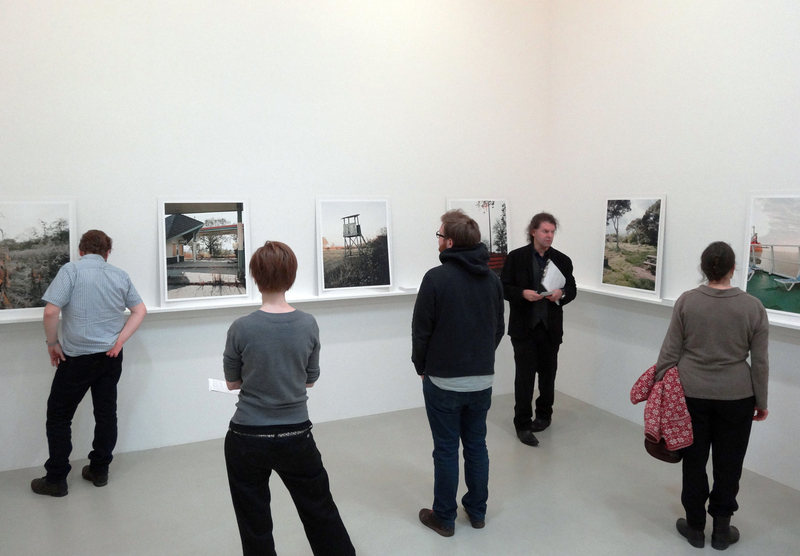 This initial decoupling of visual and written information allows the viewer to approach the work in different ways. He or she may first wander around the exhibition, looking only at the photographs and later pick up postcards to learn more. Some might look only at the photographs. 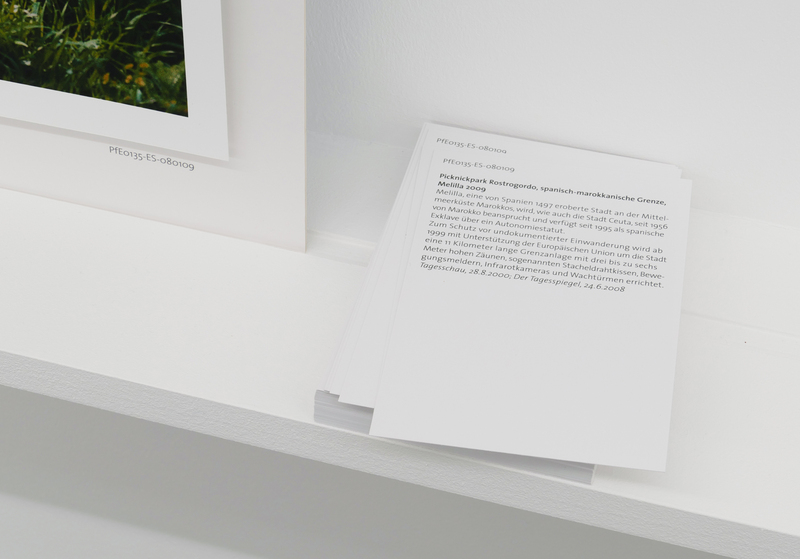 Others take text postcards home and (re-)read them days or weeks later. As well as addressing migration, I am interested in the interplay of image and text, in aspects of perception and of the processes of formation of meaning. 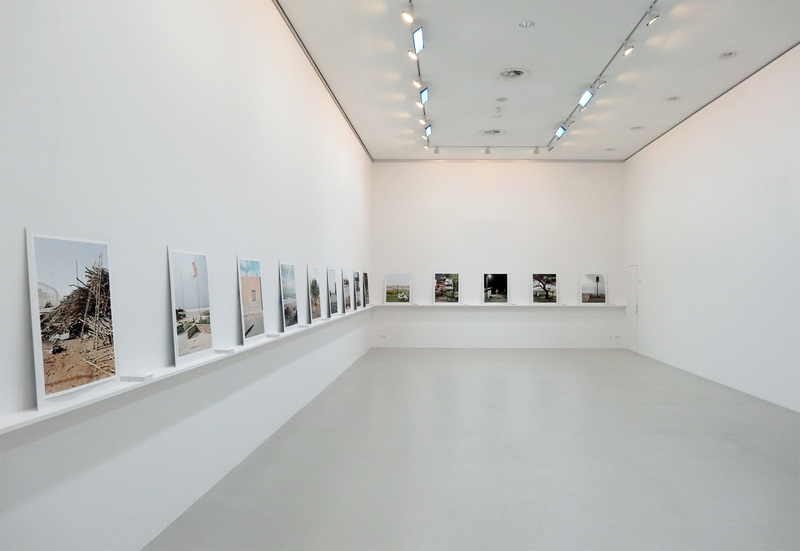 The project is conceived as an ongoing, open-ended archive.